Today, social networks, which provide a unique, special business value, have never been more important to your company’s online success. By making effective use of social media such as Facebook, LinkedIn API and Twitter, you can broaden your demographic and your target audience in order to promote your products and services, build customer loyalty and increase sales. Social media is also a great way to keep existing and prospective customers up-to-date on your company’s latest news, events and promotions. HireRussians has social network developers for hire who specialize in full-service social media integration, including social networking web design, custom properties, demographic and GEO targeting, as well as advanced marketing instrument development. With support also provided on the promotional end, our aim is for you to achieve your maximum potential in the social media world, in both exposure and profit. A well-designed professional social network founded on a leading platform like Drupal, WordPress or Facebook API can do wonders for all business types, whether you’re a start-up looking to build brand recognition or an established local business wanting to expand your reach. 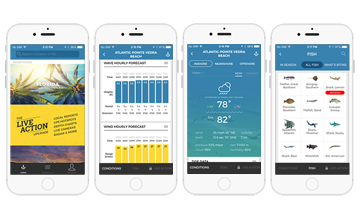 Must-have application for fishing lovers provides top locations and suggestions on the best time to fish, along with comprehensive species guide, weather forecasts and tons of tips and tricks. Users are also able to create their own fishing portfolio with photos and information about their catches. Overall Project manager and the team are very strong and deliver quality results. I appreciate their attention to detail and making Pro Angler the #1 Ranked fishing app in the app store! I am looking forward to working on new versions of our app as our business expands! So a big THANK YOU to the HireRussians team for doing a great job with PRO ANGLER! An iPhone/iPad location-based dating app for organizing double dates. 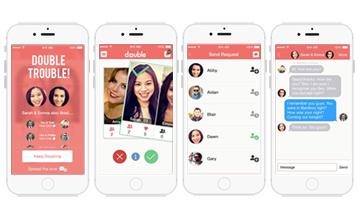 Partnered up with a friend, user can search other "doubles" nearby and anonymously like or dislike suggested pairs. Whenever the other couple likes user's profile back, an app creates a group chat, turning stressful date arrangement process into fun group gathering. Happy with work so far. Overall the app is looking great! In Kooland, a wonderful country founded on joy and friendship, children can grow a toy-character of their choice. It’s educational and fun!